Title : Europe's Last Summer: Who Started the Great War in 1914? Jagow [Germany’s foreign minister] noted that Molke [Germany’s chief of staff] told him that in two or three years the “military superiority of our enemies would…be so great that he did not know how he could overcome them. Today we would still be a match for them. In his opinion there was no alternative to making preventive war in order to defeat the enemy while there was still a chance of victory.This book disabuses one of the notion that WWI, The Great War, arrived unexpectedly. There were many factors at work, much politicking. It details the events leading up to the war. I do not have a great familiarity with specifics of what was going in in Europe in the early 20th century, so had no preconceived notions to dispel. Using the usual assassination of Archduke Ferdinand as a starting point, it is clear from the book that his death was merely a pretext. There were many political intrigues afoot at the time. Germany is fingered as the primary culprit. With Russia industrializing, Germany was afraid that its position as the most powerful European power was about to be threatened. The Military (as opposed to political) leaders believed war was inevitable. They thought that if it was going to happen anyway it was to Germany’s advantage to fight earlier rather than later, before Russia gained enough strength to overwhelm them.David FromkinThe Austro-Hungarian Empire was their vehicle for this. It was important for Germany to see that the dual monarchy remained as a great European Power, for several reasons. First, they needed an ally. Second, Protestant Germany did not want to absorb Catholic Austria, and dilute the power of its rulers. And it needed a buffer state much in the way the West needed Eastern Europe as a buffer against the Soviet Union. The assassination was carried out by an extremist group in Serbia. Germany encouraged A-H to invade Serbia. Their plan was that once Serbia was invaded, Russia would intervene to protect their ally. The German politicians could use this mobilization as an excuse to mobilize against a supposed threat from Russia. A-H would then be forced to shift it’s troops to its Russian border and therefore the Germans would no longer face a serious threat from the A-H-distracted Russkies. That would leave Germany free to invade their main competitor, France, dispatch them quickly, then return and take care of Russia. A-H, however was not in a real hurry to engage in this war. The Archduke was not a beloved figure and there were many, including in the royal family, who thought the world a better place without him.Franz Ferdinand…was a reactionary: he would have liked to turn the calendar back by a century. The Slavs who plotted against him were more reactionary still; they looked back more than five centuries. But, spurred on by German pressure, A-H eventually delivered to Serbia an ultimatum that was so extreme that no self-respecting nation could accede without ceding it’s sovereignty. The ultimatum was designed to be rejected. (Like US demands on Iraq, for example)This is a fascinating story. While the author is arguing against a view held by other historians, as someone who is not a historian, that aspect was lost on me. What was interesting was his canvas of the world at the time, what was going on, who the players were. It is written in very bite-sized chapters, which keeps the tale flowing. While it may not be the book to end all books, I found it a very interesting and satisfying read. “[T]here was no turning back. The nations were caught in a trap…a trap from which there was, and has been, no exit.”-	Barbara Tuchman, The Guns of August“The lesson to be learned from the Great War, the world was told, is that governments must be careful not to lose control. They must not let confrontations inadvertently spill over into hostilities. They must not let small wars escalate into big wars. They must not let brushfires blaze into forest fires…These are good lessons to learn, but it is not July 1914 that teaches them. It was no accident that Europe went to war at that time. It was the result of premeditated decisions by two governments. Once those two countries had invaded their neighbors, there was no way for the neighbors to keep peace…”-	David Fromkin, Europe’s Last Summer World War I can be an amazingly intimidating subject. Even though I love history, it took me years to get into it, simply due to its complexity. In order to even begin to understand how the whole thing came about, you have to have knowledge about a dozen or more other topics, each in themselves complex: the decline and disintegration of the Ottoman Empire; the internal rot of the Austro-Hungarian Empire; the Balkan Wars; Germany, and her place on the continent, surrounded by enemies; France, and her feelings following the disastrous Franco-Prussian War in 1870-71; Great Britain, and her desperate need to control the seas; Russia, with covetous eyes on the Turkish Straits; and on, and on, and on. We all know the precipitating event of the Great War: the assassination of Austrian heir Franz Ferdinand by the Bosnian Serb Gavrilo Princip. Far more important, and far more difficult to entangle, is why such calamity followed this murder. If you are interested in these questions, then David Fromkin’s Europe’s Last Summer is an excellent place to start. And even if you’re already a student of World War I, this is a great refresher and easy reference. For me, the chief selling point of Europe’s Last Summer is its structure. Yes, I know, this is a strange compliment, like choosing a car based on its wheels. But I truly believe it. The book is divided into eight parts, plus a prologue and an epilogue. Those parts are further subdivided into 53 chapters. That’s a lot of chapters for a volume that is only 305 pages of text to begin with. Some chapters are only one-and-a-half to two pages long. Why is that a good thing? Because it makes a sprawling subject a bit more manageable. Fromkin’s great ability here is to simplify without being simplistic. He takes you, step-by-step, through the moments that lead inexorably to the firing of the guns of August in 1914. His viewpoint toggles between the macro and the micro. Mostly he looks at the broad tends, and gives you sweeping descriptions about events such as the Moroccan Crisis that potted the road to war. And that’s fine. A book like this doesn’t need to have a thorough narrative of the Algeciras Conference; it’s enough that you know the end result.However, Fromkin does find a balance between detailed explanation and briefer summarizations. This is important, because a good history is both learned and readable. Every once in awhile, you need a good set piece to remind you that humans were involved. Fromkin achieves that. His retelling of Franz Ferdinand’s Sarajevo assassination is quite gripping, for example, is quite gripping.Way back in 2011, I decided I was going to start reading about World War I, to coincide with its centenary. I planned to read about the war year by year. In 2014, for instance, I would read about the battles of Mons and the Marne, which took place in 1914. Now, the centennial is fast nearing its end, and I never quite executed that plan. I am, in fact, still dawdling at the beginning. (And also: whoa, that time flew by). The problem is that the battles never interested half as much as the reasons those battles were fought at all. Why would I read about the Somme, when I’ve only read 10 books about the July Crisis? And even though I’ve read a bunch on this topic, including some really good ones (including MacMillan’s The War That Ended Peace and Clark’s The Sleepwalkers), this one still served a useful purpose. It clarified the timeline while adding helpful insights and observations. At this point, I should mention that Europe’s Last Summer is not necessarily meant to be read the way I read it. It is actually formulated as an argument about who actually “started” the First World War. I found this aspect of it to be its weakest point. Fromkin’s argument is that the blame rests at the feet of the German Empire. It began with the “blank check” to Austria, and continued on up to mobilization, with von Moltke and the German General Staff nudging a vacillating Kaiser Wilhelm II to fight now, when they were at their strongest. Nothing that Fromkin says is necessarily wrong. I also can’t say that his conclusion is wrong, if only because the term “wrong” has no meaning in this debate. There is no objectively correct answer. I will say, though, that I found Fromkin’s analysis to be pretty facile, and at times, a bit ludicrous. Fromkin demonstrates, at certain points towards the end, a sort of blinding stridency that blurs historical reality. There were five Great Powers involved in the diplomatic breakdown leading to war. Of these five, however, Fromkin focuses only on the malice of Germany and Austria-Hungary. What about France and Russia? What drove France and Russia to join the fray can be covered in a sentence: Germany declared war on them, and they defended themselves. Of the Great Powers that stood together against Germany and Austria in August 1914, only Britain had been allowed the freedom to decide for itself whether to go in or stay out.This is a rather stunning example of venerating form over function. Yes, due to Germany’s diplomatic blundering, Germany maneuvered itself into having to declare war. But to say that Russia and France were helpless innocents who had to defend themselves is incorrect. First, and most obviously, France and Russia immediately went on the offensive. Russia plunged into East Prussia, while France’s Plan XVII called for retaking Alsace and Lorraine. These attacks were not made in some sort of preemptive self-defense. They were made with territorial aspirations in mind. That leads to my second point: France and Russia had just as much reason to go to war as Germany did. Despite Fromkin’s blithe dismissal of French intentions, they clearly wanted to retake the regions they’d lost to Germany during the Franco-Prussian War. This is shown by the fact that when war broke out, that’s exactly what they attempted to do, right away. Russia, too, had important interests at stake; they were in a struggle with Austria-Hungary for hegemony over the Balkans as the Ottoman Empire disintegrated. Some historians, such as Sean McMeekin, place most of the onus for war on Russia and her own failed diplomacy. This is not a deal breaker, since – as I’ve already said – there is no right or wrong answer. The only wrong answer is declaring with certainty that you have the right answer. Still, this intellectual yada-yada-yada-ing definitely knocks this down a peg. While this has much to offer for seasoned buffs, I’d especially recommend Europe’s Last Summer to anyone looking for a volume to start them on their own WWI journey. If you want to join in this argument so you can cast an accusing figure at historical figures of the past, then this is an excellent place to get started. As we appoach the 100 year mark from the start of this war, a lot of Great War literature has appeared. I started Catastrophe 1914: Europe Goes to War which is current and popular but got lost in the details and found this on a library shelf. I liked its layout. Simple short chapters taking items one issue at a time.While I don't know if historian, David Fromkin's theory of two wars is mainstream or not, the book has what you need to understand the causes. Fromkin starts by showing Europe at the time and the interests of the great powers. Austria wanted to "crush" Serbia. Germany wanted a "preventive war", an early one it could win before the very populous Russia further industrialized. France was weak, and seemed to be available and had colonies.Into this came a school boy who killed a hated archduke giving Austria a pretext, however flimsy, to deal with Serbia. Germany responded to her aggrieved neighbor, Russia mobilized to respond to the threat to Serbia where it had influence, and voila, Germany could get its "preventive war". Britain wanted to protect France to keep the status quo in and around the Channel. It is not fully clear how Germany decided on the two fronted war, but marching to Belgium was too close for comfort for Britain.Fromkin goes further than naming countries as culprits. In going step by step from the assassination to the mobilizations he points to who, among the small group of invisible to the public individuals, he deems most responsible.The end, like the beginning, gives a synopis of why is war remains significant today. Fromkin notes that the stated reasons for the war had nothing to do with its ending... and are fully divorced from the issues of the peace negotiations. It was in no way "preventive" for any of its participants or neighbors. A well written book about the years leading up to the Great War. It is well researched and the author builds a good case that the war was not necessarily a result of the assassination of Archduke Franz Ferdinand at Sarajevo but instead, an accumulation of factors that had been building over several years.....economics, social unrest, colonialism, and militarism. Very well done and required reading for the scholar of turn of the 20th century European history. As the 100th anniversary of the Great War approaches, I thought I would test the waters and see what some recent historians had to say. In his highly informative, historical tome on the lead-up to the Great War, Fromkin not only dispels the simplistic view that the assassination of Archduke Ferdinand began a series of events that led to military action, but also seeks to propose that its start was anything but a total surprise to the European powers. Simplistic world history texts still present this as the foundational argument behind the European conflict, Fromkin argues that this is an attempt to gloss over some of the tension and intricate politicking taking place in Europe leading up to the summer of 1914. He proposes that Europe was a powder keg of potential conflicts, some accentuated by regional wars in the late 19th and early 20th centuries, leading up to June 28th, 1914, which made the final result inevitable, leaving the date the only mystery. The assassination was but the final spark, even then possibly a ruse to justify retaliatory action. Fromkin asks readers in the title who was a cause of the Great War, offering at least three plausible answers throughout the text's first seven parts: Germany, Austria-Hungary, and Serbia. In this well-structured book, drawing on many sources, both recently and dated, Fromkin leads the reader through the various options, presenting key chronological events of the happenings within the states directly involved in the potential conflicts. By Part Eight, Fromkin offers his own assessment, that the majority of blame did and should lay at Germany's feet. Powerfully presented and easy to follow for the reader well versed in history and those looking to pique their own interests.By handing blame to Germany, Fromkin details Kaiser Wilhelm II's desire to use his strong military while it remains a threat to other states. Wilhelm sought to use this strength not only to bully his enemies, but also to show how ready Germany might be for any military action, especially against the predominant powers of the time; Russia, England, and France. Deemed crazy by his cousin, Tsar Nicholas II of Russia and a completely unstable leader by his grandmother, Queen Victoria, Wilhelm ignored those who sought to criticise him or seek peace and chose strong military men who shared his desire to obliterate any enemy. By aligning Germany with Austria-Hungary, another aggressor in the region, Wilhelm ensured an iron fist over much of the region, and into Africa's imperial lands. Fromkin argues that Germany's blank cheque approach to assisting Austria-Hungary was the predominant reason the conflict escalated from a small regional war into a full-on European aggression. Deceptive actions surrounding Austria-Hungary's ultimatum to Serbia help only to vilify them all the more, with the added refusal to engage in any peace conferencing after Austria-Hungary made aggression its only option, added to the argument that without Germany's military might, a conflict on such a large scale could surely have been averted. It can also be argued that Germany pushed Austria-Hungary to declare war on Serbia to offer a reason to turn around and attack Russia and invade France, its plan all along.Austria-Hungary's greed and power-hungry nature, fuelled no doubt by Germany and the aforementioned blank cheque, helped catapult the Empire into the role of warmonger no matter the cost. While Emperor Franz Joseph led the Empire and sanctioned expanding its holdings in Europe, the manner was anything but savvy. Looking to the Baltic states, Austria-Hungary felt it best to choose sides in the two Balkan wars of 1912 and 1913 and then play a rousing game of nation-state Jenga, pulling blocks from all sides to realign its allies in order to find the best 'team' for eventual aggression in the region. Fromkin illustrates the infantile swapping of allies the Empire made during and after both Balkan conflicts, issuing strongly worded treaties to those it deemed best to join them as they eyed the spoils of Europe. The Empire could not handle the powerful Serbia, whose victories in the aforementioned conflicts led it to be more powerful and a threat to the Empire's Bosnia-Hertzegovina state. A secret alliance with Germany to crush Serbia remained but an idea before the assassination of the heir to the Hapsburg throne, Franz Ferdinand. When Gavrilo Princip assassinated the Empire's heir apparent, Austria-Hungary used this as a perfect opportunity to implement its plan to obliterate Serbia, ignoring that he was Bosnian and thereby a citizen of the Empire. Alas, its bungling of the response and eventually delivery of an ultimatum so full of impossible requests paved the way to armed conflict and the inclusion of allies to protect one another made war all but inevitable. There is no doubt that the Empire's single-mindedness about territorial superiority, with a German military at its beck and call, helped bring about a regional war with Serbia, and veiled Germany's larger plan to commence a war with its two great enemies, turning it into a continental war that spilled into the world sphere. It should be noted that Austria-Hungary was crushed both by Serbia and Russia in the War, making its sabre-rattling all the more futile.While it is easy to vilify the villains of history, one cannot simply leave Serbia off the hook for any responsibility. A regional powerhouse with territorial aspirations, Serbia sought to regain some of the territory it lost in its Balkan conflicts of the 14th and 15th centuries, well before anyone had heard of Germany, Prussia, or even Austria. While one cannot fault the state for this, there is an inherent undertone that outsiders will take notice and perhaps act to stop the ever-expanding aspirations (though England, France, and Russia seem not to have done so when it came to Austria-Hungary). Allying itself with Russia as well could not have hurt Serbia, knowing that having such a power in its corner would help, should the need arise. That said, Fromkin presents documented evidence (and alludes that other historians have found it too) that the Serbian government, headed by Prime Minister Nicola Pasic, not only knew of the Bosnian Princip's plan to assassinate the Archduke, but also was well aware of the Serbian militant group, the Black Hand, and its plans to disrupt the Austro-Hungary leadership. Serbian officials did little to stop the end results, though there is some speculation as to whether Pasic did try to inform border guards. Sitting on the knowledge, knowing full well what would come in retaliation fuels the argument that they permitted an escalation of tension and tossed the match on the pyre to ignite the war. Debating whether responding more favourably to the Austria-Hungary ultimatum is futile, for the document itself was surely a ruse well past any negotiation point. Knowingly sanctioning the Black Hand's actions and relying on Russia to support it when war was declared help to cement blame at the feet of the Serbs.While a relatively short book, it packs much into its chapters and tells a story as effectively as a drawn-out tome. A great read for history buffs who may have tired of the 'active war' accounts to show how things got so bad. When Fromkin offers his summary and presents his own conclusions, I read ansd absorbed them with much interest. He lays out not only the facts, but supports them with key historical events. As I read, I could not help but think that Margaret MacMillan's Paris 1919 would be an excellent companion to show the before and after effects of the Great War. The two would also help strengthen Fromkin's argument in the introduction that much of the current political and military strife is tied to the outcome of the Great War (discussed at length in MacMillan's tome), including the Middle East's disjointed creation into states based more on geographic convenience than historical and tribal lines. Kudos, Dr. Fromkin for this fascinating piece of work that not only stuns the reader but opens many new pathways of historical exploration. I'll keep my personal opinion of which of the aforementioned three states are to blame for the Great War to myself, in hopes of letting all who read the book to come up with their own conclusions... or perhaps posit others to add to the mix. One of the main props of Hitler's vitriolic propaganda was to condemn the Allies' position at Versailles that Germany should be the only nation to pay reparations since it was solely responsible for starting the First World War. Putting aside the problems caused by the reparations, which were substantial and in hindsight bad policy, there remains the issue of who started the war.Fromkin puts that responsibility squarely on Germany, which encouraged and manipulated the Austrian declaration of war against Serbia into its own war against Russia and France. *** the internationl conflict in the summer of 1914 consisted of two wars, not one … both were started deliberately, one by the Hapsburg Empire and the other by the German Empire … the decision to launch war - in both cases - was made by a few individuals at the top ... both wars were about power, about the relative ranking among the great European powers ... both Germany and Austria believed themselves on the way down ... each started a war in order to stay where it was*** it was (Chief of the German General Staff) Helmuth Moltke who wanted war against Russia and France … he artfully substituted his war for support of the Austrian-Serbian war … Moltke represented the Prussian Junker officer caste whose militarization of German life led to the war.IN MY NEW NOVEL-IN-PROGRESS ... I plan to incorporate Fromkin's controversial but well-documented conclusion (published in 2004) into a discussion one of my fictional characters will have with Marshal Josef Pilsudski of Poland. Pilsudski was involved in the WWI fighting, would probably have known the German generals and staff personnel, and was a brilliant strategist who could well have perceived events as Fromkin later reconstructed. Such is the opportunity offered to the writer of historical fiction to fill in the blanks of history - as long as the known (???) truth allows that it could have happened that way. I took a class in college titled Europe: 1914-1945. The final exam was, "Choose one cause for World War I and defend your choice." I chose Russia's early mobilization. I got an A-. That was in 1995. Since that time, apparently, a veritable treasure trove of information has been discovered that really seems to clearly point to Germany wanted this war, created a scenario to have this war, and manipulated other nations into falling into it. I never think that anyone is pure evil, with the notable and usual exceptions of Hitler, Pol Pot, Stalin and others who killed millions out of insane hatred and paranoia. I don't believe the primary architect of Germany's desire to go to war, Moltke, was evil. However, if sources of this book are to be believed, the lines between evil and stupid are very blurry indeed. This book is absolutely fascinating and it reads very well as a countdown. Each chapter explains why Europe was a powder keg and that Germany and Austria were both holding matches with an intent to light the fuse. For history buffs, I highly recommend this. Honestly, I wouldn't steer anyone away from it, though, it is a thoroughly engrossing and well-written book. I am now seeking to read Fromkin's history of the modern Middle East, A Peace to End All Peace. In David Fromkin’s most recent book he takes on the heavily written but still asked question of who started World War I. Fromkin attempts to redistribute the blame for the war, while Germany still receives some, a large amount is also placed on Austria-Hungary. Fromkin also claims that while the people of Europe believed that war was no longer a possibility, Europe’s political and military leaders could see the war coming. Much of Fromkin’s work focuses on the geopolitical machinations of Germany and Austria-Hungary as well as the responses and actions of their neighboring countries. Much of the book however, focuses on the tensions between Austria-Hungary and Serbia. Given a lesser but still equally important presence in the book is Austria-Hungary staunch ally Germany and the more fair weather friend Italy as well as Serbia’s great power sponsor Russia and its allies Great Britain and France. Fromkin also gives a significant part of the book to examine the arms buildup that was occurring in the great powers of Europe. One of the justifications for these buildups Fromkin claims is the anticipation of a great general war which. The other is for the imperial expansion of the great powers into the now decaying Ottoman Empire. While the book covers these subjects, the entire last part of the book is devoted to going more in-depth to explaining Fromkin’s theory. Fromkin’s analysis of the countries responsible for World War I is the most interesting and well argued point of the book. While not saving Germany from all of the blame he lessens it to an enthusiastic backer of the Austria-Hungary, while also needing to posture its self to appease its allies and its people. Austria-Hungary however is given for more blame than more perennial books on the origin of World War I like Barbra Tuchman’s Guns of August. Fromkin’s argument that it was Austria-Hungary’s attempts to prove it was not the new sick man of Europe and to assert imperial hegemony over Bosnia-Herzegovina caused the war is well put. It was through these actions that Austria-Hungary hoped to gain a better position against Russia, while at the same time removing Russia’s influence from the Balkans by way of removing Serbia. This inadvertently or as Fromkin believes knowingly caused the First World War. While Fromkin is well versed in this period of time and has contributes several volumes of work to it as well, this book stands out from the rest. While many books simply follow the status quo of Germany being the provocateur of the war, Fromkin points out that Austria-Hungary has remained relatively blameless despite its obvious fault in escalating tensions with Serbia. Fromkin attempts to rectify this issue and does so in a very readable way. While his argument that the leaders of Europe saw the war coming and did not stop it is outlandish, it is only a minor detractor from an otherwise excellent book. Written in spare, clear prose, Fromkin's book takes the form of a whodunit: who really started the First World War? Since WWI led to the Russian Revolution, the rise of fascism, World War Two, and the Cold War, and thereby shaped the entire 20th century, the question is neither pedantic nor frivolous. The author's answer stems from this clarification: World War One began was two wars, one launched by Austria against Serbia following Gavrilo Princip's moment of fame, the other initiated by Austria's German ally against Russia and France, using Russia's partial (and rather trivial) mobilization in defense of Serbia as a casus belli. Germany's military commanders, Fromkin notes, had been contemplating war with Russia since 1904 or 1905, fearing that Russia's industrialization would make her unbeatable unless Germany fought a pre-emptive war. Such a war, however, would also oblige Germany to defeat Russia's French ally, and while German generals believed they could quickly knock out France (as in 1870-71) they needed Austria to pin down the Russian army until the French were subdued. The Austro-Hungarian government, for its part, was uninterested in war with Russia but terrified of Serbia, which, after the Balkan Wars (1912-13), the Austrian regime feared would lead a revolt of the empire's own southern Slav peoples. When Austria sought German support for a punitive campaign against Serbia in 1914, they got it, but only on condition that they join a German war against Russia. In the end, the war was not an accident produced by misunderstandings and rigid railway timetables - it was instead the product of deliberate decisions by a very few men in Berlin, Vienna, and Sarajevo. Left unsaid, perhaps necessarily, is the huge role that popular militarism played in starting the war; the deliriously happy crowds who celebrated the outbreak and rushed to the colors in 1914 cannot easily be explained in a book devoted to high-level decision-makers. Such enthusiasm does help explain, however, why Europe's leaders were able to mobilize huge armies during the war and keep the conflict going in spite of disastrously-high casualties. Ever since reading Solzhenitsyn's "August 1914" I've been utterly fascinated by the lead-up to World War I. In this book Fromkin sets the stage for the war by showing how the Great Powers and the Central Powers began a then unprecedented arms race. The recently unified Germany became a threat to the other nations, and began expanding their empire abroad by gaining colonies. As the rivalry heated up, the move toward war became inevitable. The political and military elites knew war was coming.Austria-Hungary used the pretext of Archduke Franz Ferdinand's assassination as the pretext to declare war against Serbia--a move they'd already been planning toward prior to the assassination. Austria-Hungary's ally, Germany, gave the okay to pursue a quick war with Serbia, but Austria-Hungary moved too slowly, not declaring war for nearly two months. In the meantime, the rest of Europe thought the crisis had passed.Yet the secret plan had begun and was moving inexorably toward war as Germany had long sought war with Russia, Austria-Hungary had long sought war with Serbia. The two used each other and the circumstances to their advantage, or so they thought. What happened is that the two got caught in their own schemes and brought upon a World War that was the beginning of the end for the West.This is a very good book, explaining the events of the summer of 1914 well and showing why and how war came about as it did. If you are looking for a book that explains why and how the First World War started, this is the one. The author introduces the situation in the preceding years and then focuses on the events during the "last summer" before the war started. The chapters are very short, which I found helpful for taking in the information in manageable chunks. With each new development the author explained the context of the event, which did mean quite a lot of repetition of information covered earlier, but this too has it's advantages: for someone (like me) who does not know the details of the period or the arguments related to their interpretation, or for someone who just wants to read a section of the book that might be of most interest, there is no need to jump back to earlier parts to understand how the events fit in to the narrative as a whole. So Josh Marshall of talkingpointsmemo.com was going off a bit on twitter a while back about how discredited the whole The Guns of August "European war that nobody wanted" idea was. Feeling stupid, I asked him what book I should read if I'd only ever read Tuchman on WW1. He responded and recommended this book.I don't know Josh Marshall. He is a celebrity as far as I am concerned. So I had to read the book.The book is structured roughly as follows: first, it lays out the existing general view of the war. Next, it slowly builds up the circumstances surrounding the war, from a rough world historical sketch down to the concrete diplomatic details at the beginning of the 20th century. After that, there's a detailed look at the conspiracy to assassinate the archduke, followed by a review of the period from the 28th of June, when the archduke was assassinated, to August 4th, when the UK declared war on Germany. The book concludes with a review of the evidence at hand with the intention of determining fault, as well as determining the real motivations of each party to the war.If you aren't interested in this period in history, I recommend reading the opening chapter or two of this book. My grandfather was a veteran of World War 2; for me and everyone else I'm sure, that has always been the great war as far as we're concerned. Fromkin really opened my eyes to the pivotal role this war, which I had always thought of as minor compared to WW2, played in wiping out the last remains of 19th century institutions. It was astonishing to me to see the beating heart of all the conflicts in WW2 right there in WW1, just underneath the bellicose emperors and kings. Anyway, I loved this book. I'll probably carry an interest in this period with me for a little while thanks to it. A rather exceptional book that tries and mostly succeeds at disproving the long running theory that the first world war was caused by an inevitable cascade of events and that the cause was that started the domino effect was the death of the heir to the Austrian-Hungarian throne. It theorized that in fact what we consider as WWI was in fact two wars that eventually combined after the failure of the Austrians. With this insight it allows the reasoning behind the cascade effect to dissolve and shows the motives behind Germany and Austria's desire for war. A very good book that is essential if you want another view point besides the Guns of August that has much more updated references and scholarship. Fromkin makes an excellent attempt to understand how the Great War appeared out of the blue. He argues that Europe at that time was very tense and was not at all peaceful as public perception currently is. The military officers of all countries were busy preparing for a war on a massive scale - the question was not if, but when. According to the author, World War I consists of two wars - Austro-Serbian War, and the German War against France and Russia. The latter grew out of the former and swallowed it. The German General Helmuth von Moltke was insistent on fighting a war against France and Russia when the timing was right - a few years later, Germany would have been unable to defeat them according to the German officer corps. Von Moltke wanted to make sure that Austria-Hungary would also be part of the war, since the Dual Monarchy had not supported Germany's belligerent actions in the past. When the Archduke was assassinated, the Germans convinced the Austrians to declare war on Serbia and win quickly, so that it can show a fait accompli before the rest of Europe interferes. But the Austrians took very long to execute their plans. At the same time, Moltke was hoping that Russia would mobilize, even partially, so that Germany would have some excuse to declare war on it. When Russia did mobilize, Germany mobilized immediately and poured into Belgium and France. This a good piece of historical study, but I feel that it focuses on the German and Austrian ministers and generals too much, and that the British, French and Russian statesmen are more or less relegated to minor roles. One must read this book along with Patrick Buchanan's "Churchill, Hitler and the Unnecessary War" to get a better view of the causes of the Great War. I picked this book up because as the centennial of the Great War approaches, I realized I knew little to nothing about what the war was about. It's embarrassing, as much as I love history, to not know the answer to a history question asked by one of my kids. (the little geniuses will likely keep me on my toes forever!) So, I grabbed this one in a moment of fancy at the library, because it was the thinnest book about the war that I could find, and appeared to focus on its origins rather than just minutiae about battles and troops.I was NOT disappointed in this one. The author does a great job of portraying the march to war, from the origins of conflict in Europe, to the shooting of Franz Ferdinand, to all of those events of the "last summer" that led to the full blown world war. I really learned a lot from this one.My only real criticism is that in the summary at the end, the author really does pin most of the blame on Germany and its military leaders and advisers, without really exploring other avenues of blame that he hints at, such as all the issues regarding Russia. I plan to do some more reading about this era to broaden my knowledge, but it seems that Russia would hold a lot of the blame for what happened, at least in my limited knowledge.As a side note - it is absolutely PATHETIC, what we are taught in high school about this war. I think it was mainly brushed over. We learned about Franz Ferdinand getting shot and loads of alliances pulling everyone into the war. That's really it. For an event with such broad reaching after effects, it's surprising that we don't pay more attention to it here. Excellent reading for the lay historian. I'm listening to it on Audible while I'm reading it and Alan Sklar has a voice that makes you forget it's non-fiction! Since I'm studying the Great War this year, this is a pretty good book to play in.Fromkin takes you step by step, detail by detail through the days between the assassination of the heir to the Austro-Hungarian throne (Archduke Franz Ferdinand) and the declarations of war by the European powers. From relatively new research, Fromkin explains that the reason for the Great War was not because of the assassination, but because Germany essentially wanted to rule the world. German civilians, not the military, encouraged Austria to go to war with her old enemy Serbia, and in doing so, focus the rest of Europe's attention away from Germany. While Austria was busy, Germany mobilized for war against France and Russia, then required Austria to drop her war and fight with Germany. There were two wars started by two separate countries, for two different reasons. With old, incomplete information, historians claimed the world fell into a war which could have been avoided. New data indicates that the war was not meaningless and not in response to the Archduke's assassination. There was a specific reason Germany needed Austria to engage Serbia in a war. Germany believed July 1914 was the perfect time to go to war and "in defense of Austria" was a reason the country could accept. She had been planning the war for a year. The Serbian affair served that purpose. The Austrians had one reason to fight Serbia; eliminate them.Fromkin provided an excellent, informative read. A must for my home library. Fromkin has a straightforward and easy-to-read style. This book is no exception. At the same time all the main characters are well developed, and what used to be total confusion in other books of WWI I've read, is crystal clear in his exposition. The main thesis is interesting and believable--two wars instead of one--although not at all definitive in my opinion. There is so much evidence that's still missing, that even filling the blanks (as Fromkin does) doesn't no provide a completely convincing argument. What's really well developed is the pre-war years; it wasn't a peaceful world as a lot of people thought and wrote about. European dominance (or lack of it) was in most states minds, so the thesis that war was inevitable is right in my opinion. I gave this book four starts because is too redundant and too long for what it is. It feels like reading the same book twice, which may be good since you won't forget the main thesis and characters. At the same time it gets tedious, specially the last parts when the thesis is repeated over and over again. This is a comprehensive and methodical inquiry into the wide-ranging factors that led to the outbreak of the Great War in 1914. The author starts by reviewing what seems to be a random collection of events and personalities, and methodically demonstrates how these desperate threads slowly weave into a coherent whole. Most interesting is Fromkin's analysis of the interplay between erstwhile allies, who were often working at cross-purposes. Fromkin also makes clear that the drift to war was deliberate and not a series of accidents that spun out of control. The stage for the history of the 20th century was set in World War I, and this compact volume is essential in clarifying the often confusing and oft misunderstood events that led to its outbreak. A valuable addition to our understanding of conflicts that engulfed Europe from 1914 through the fall of the Soviet Union in 1990's. It also demonstrates the seductive logic that the machinery of war can have on leaders and military planners. Highly recommended. I'll be looking for this author's name again. I'm about half way through at this point but am really impressed. He makes history very readable. He mentions previous research and either backs it up with new information or explains how the new information contradicts the conclusions previously drawn. He goes into a bit more of the personal history of the historical figures mentioned, fleshes them out a bit, which makes them seem more like real people and makes it easier, for me at least, to relate to and remember them as more than pictures in a history book. Finished now and feel the same. He writes 300 some pages on, mostly, just the summer and fall of 1914 but I didn't find it boring. He finishes with eight chapters that sort of reassemble all the pieces previously stated but even that has fresh insight. Maybe this is overkill for someone with a strong background in history already, but for me it was readable, convincing, and educational. 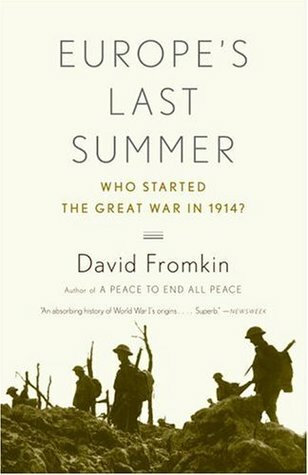 “It takes two or more to keep the peace, but only one to start a war,” David Fromkin, ‘Europe’s Last Summer’. This book is a must read for anyone interested in The Great War. The author, Mr Fromkin, delivers keen analysis delivered with an economy of script that is clean, crisp, concise, and clear enabling the reader not only to grasp the facts but fully to understand their impact and nuance. He presents the issues through the lens and in the context of that time thereby avoiding the muddle-headed, group-thinking analysis that insists on using the lens of today. In short, the wind of his words blew the fog out of the beginnings of this war. 5 stars, essential reading. The capsule summary for this book is spot on....I would just add that I have read at least 4 books about the Great War and this is the first one which I feel has given me a clear picture of how it really began, and why. Highly recommended (if you are interested in the topic). The reasons behind WWI read like an insane remake of Downton Abbey. This book does a great job detailing what everyone was thinking. On the downside, some of the book is an endless slog of "he said this, this other guy said that, etc". This is a good addition to the books about the Great War. Fromkin did a good job showing how peaceful Europe's "last summer" was and explaining how the war started in 1914 instead of 1908, 1910, or at a different time. It was easy to follow. Kaiser Willie! How wrong we were! A regular peace-nik! It was going to happen-just when? Actually two wars. Austria-Hungary invades Slovenia, (rather tardily) & German invades Luxembourg. Author David Fromkin's approach to the origins of WWI eschews multifacted explanations of the war's genesis and endeavors to place the blame on specific individuals—primarily on German Chief of the General Staff Helmuth Moltke but to lesser extent Austrian CGS Franz Conrad von Hötzendorf. In Fromikn's telling, WWI was in reality two wars conflated together: Austria's war on Serbia and Germany's war on Russia (& France). In his telling, the assassination of the Archduke Franz Ferdinand gave the war party license to deal with Serbia as it had long desired. Then, rather than try to keep Russia out of this war, the German war party leveraged the crisis to ensure that Austria, its lone, wavering, weak ally, fought on Germany's side in its own war against Russia and France. There is much to commend this interpretation of events, but the author sometimes fails to make his case convincingly to a skeptical reader. Primary sources are often subordinated to pat explanations. Motives are put forth without much support. Complex social forces like the Prussian Junker class are treated as if they are single individuals with clear and uniform agency. Complications are hand-waved away. The argument is nonetheless a good one (and one that is simple to explain), but I was left wishing that the argument had been more nuanced and explicit. For example, scant consideration is given to the possibility that the leadership in Russia and France might also have wanted war and that their actions in July 1914 can similarly be placed within that context and some blame for the escalation of the crisis assigned to them as well. This is especially unusual given the pains that Fromkin goes to point out that antebellum Europe was not, contrary to popular perception, in the midst of a blissful period of peace but rather the site of an escalating arms race and increasingly frequent conflict (in the Balkans, Morocco, &c). On the whole, I would recommend this book to anyone interested in the origins of WWI. The writing style is very accessible, even to someone new to the subject, even if I found it a bit breezy for my taste. (The metaphor in the book's opening chapter deserves specific mention for its utter lack of explanatory utility.) It's probably neither the first or last word on the subject, but, as a simplified, black-and-white indictment of the origins of WWI, it's a worth reading for those interested in the subject. This book got worse with more post-reading reflection.I wanted to give this a fourth star, but just couldn't do it.Per some other reviewers, Fromkin's conclusions, other than the two-war idea, that Austria wanted war with just Serbia and Germany was willing to use the Austrian casus belli as a pre-emptive war igniter, are too pat.And, even that is not as proven as he claims. The Kaiser was not the only German, at least on the civilian side, who wanted Berchtold and Hötzendorf to attack Serbia ASAP, first of all; related to that, other civilians, if not the German military, also seemed to have supported the idea of "take Belgrade, then stop." But you won't here this from Fromkin. Also, if Germany and Austria weren't fully coordinating with each other, then how can both of them be the cause of WWI?That said, if they WERE coordinating with one another, where's the lead person in that coordination? In what I can only call shameful, Tschirschky, German's ambassador to Vienna, is mentioned but once in the whole book.Fromkin also stumbles, it seems, over the connection of Apis and the Black Hand to Princip and co-conspirators. He notes that Apis' lieutenant, Tankosic, provided their training, smuggled them back into Bosnia, etc., yet wants to say that Princip acted on his own. While noting that the Black Hand then voted to call off the assassination, and then saying it voted later to put it back on again (while noting that Princip refused to go along with stopping it), he neglects to report that Tankosic had reported the plan to Serbian Prime Minister Pasic.Later, Fromkin claims that Apis used relatively inexperienced people like Princip almost as cutouts. He hints that Apis actually wanted them to fail, because this would give him some leverage against Pasic in some way.Problems abound, though. First, he doesn't say exactly how this would provide leverage, nor, short of a coup, how Apis would use it. Second, he doesn't, through his omission of Tankosic's "ratting" to Pasic even as Apis' lieutenant, take account that Apis didn't control the Black Hand as much as Fromkin implies.Finally, he gets close to conspiracy theorizing by noting that Austria had developed plans to overrun Serbia two weeks before the assassination.A book like "July Crisis" is a much better overview. Fascinating revisionist history, based on archival sources mostly not available to historians of a generation earlier; it largely overturns the thesis of an accidental war, of statesmen and military leaders "blundering into war", constrained by mobilization schedules.Germany and Austria both wanted war, though each wanted a different war, and each lied to its ally about what war it wanted, and how it wanted to involve the other. The German general staff knew that war would destroy European civilization, but believed war inevitable; as they believed that Russia was building its resources faster than Germany could, war (if to be successful) needed to be launched soon. Germany needed Austria as an ally, in order to slow down Russia while itself taking out France. Austria, on the other hand, needed to destroy Serbia as on object lesson to the Slavs making up a large part of the Balkan portion of her empire; she needed Germany as an ally to keep Russia in check. Neither shared with the other.Rather destroys the modern assumption that modern, or at least western, countries never really desire war. David Fromkin - David Fromkin is a noted author, lawyer, and historian, best known for his historical account on the Middle East, A Peace to End All Peace (1989), in which he recounts the role European powers played between 1914 and 1922 in creating the modern Middle East. The book was a finalist for both the National Book Critics Circle Award and the Pulitzer Prize. Fromkin has written seven books in total, with his most recent in 2004, Europe's Last Summer: Who Started The Great War in 1914?A graduate of the University of Chicago and the University of Chicago Law School, he is University Professor, Professor of History, International Relations, and Law at Boston University, where he was also the Director of The Frederick S. Pardee Center for the Study of the Long-Range Future. Fromkin also sits on the editorial board of the Middle East Quarterly, a publication of the Middle East Forum think tank. He is also a member of the Council on Foreign Relations.